While it’s less than two months before Captain America: Civil War hits theaters, there is still work to be done on the final cut of the film. The Russo Brothers are currently in the sound mixing stage of the movie’s post production work and Joe Russo decided to drop us all a line and say hi while the mixing team was in the middle of their work. It also gives us a another brief glimpse at the movie, specifically the scene where "Thunderbolt" Ross reads the riot act to the Avengers. Check it out. Joe Russo is running the camera for this little behind the scenes Facebook video. While he’s using it to introduce us to several of the crew that make Marvel movies great, we can’t help but look at what they’re all working on. 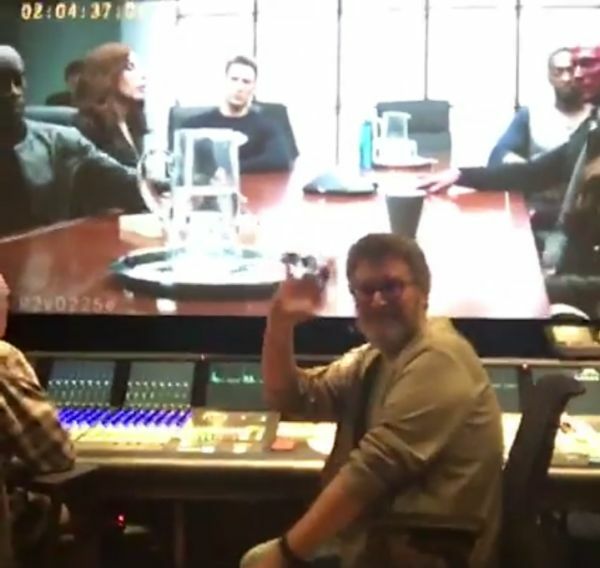 In the background of the sound board is the rough cut of Captain America: Civil War as it is being worked on, so what we get is a little bit of an Avengers photobomb. We’ve seen this scene from a few different angles in the trailers, but here we can actually see that there are several more Avengers in attendance than we were previously aware of. Both James Rhodes, aka "War Machine," and Vision are also sitting around the table with the likes of Captain America, Falcon, Black Widow and Scarlet Witch. What we end up with is an even split of of the number of people who will end up on each side in the conflict. There’s some real potential for drama here as each side looks at the same information and comes to very different conclusions about what it means. You can tell just by looking at the image that everybody here is feeling depressed based on what they’re being told. Also, Vision is wearing regular clothes, possibly a suit, which just looks wrong. Joe Russo says that they’re a week and half from delivery on Captain America: Civil War which means that right about the time the final cut of the film is being finished, they’ll get their first look at what the competition is up to as the delivery date is apparently close to the release date of Batman v Superman: Dawn of Justice. How excited are you to see the finishing touches on Civil War? It’s so close to being real. It will be out May 6.